Albert Einstein called it the “Eighth Wonder of the World”. 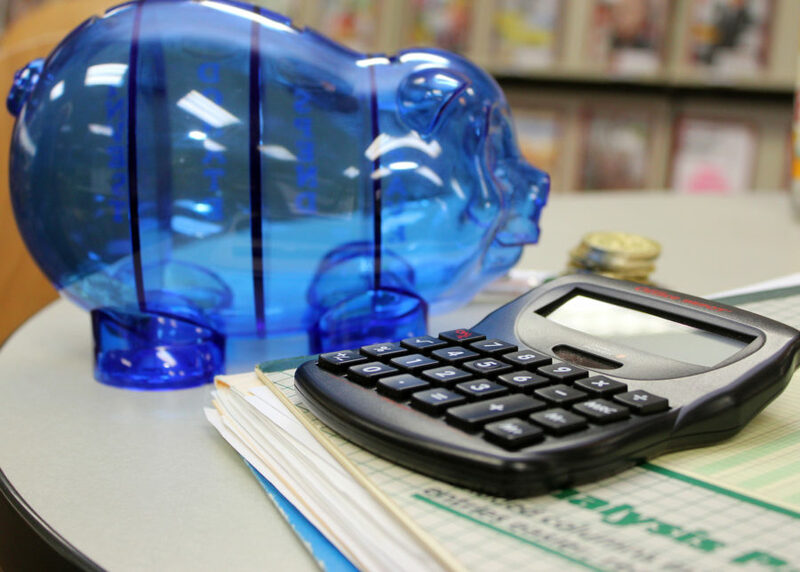 Your money multiplies over time, but first you have to put it to work for you. 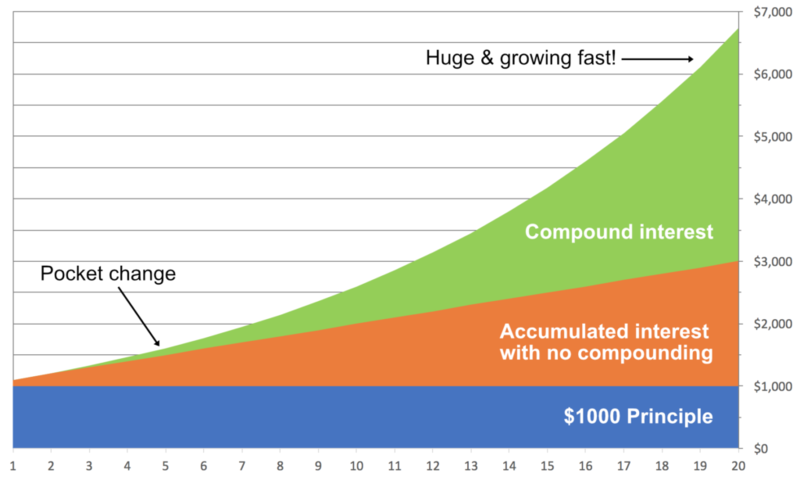 For example, $100 invested for one year at 5% interest becomes $105 at year’s end. Left untouched, that same amount becomes $163 after ten years. Beginning investors need focus on just three categories: cash, stocks, and bonds. Cash categories (that includes checking accounts, money market accounts, CDs, U.S. treasuries and corporate bonds) keep funds “liquid” for emergency funds. Stocks represent part ownership in a company, while bonds are a debt security issued by the company borrowing money. Cash is safest, but usually offers the lowest rate of return. Bonds are relatively stable, with an average historic rate of return of 5%. Stocks are the riskiest of these three, and have averaged a historic rate of return of 10% since 1926. Aggressive growth: Great for young people building long-term wealth: 70%-80% in stocks, 30%-20% in bonds. Balanced growth: Suited for middle-aged investors, balancing growth with safety: 50%-60% in stocks, 50%-60% in bonds. Conservative growth/income: Best for those approaching retirement; 30%-40% in stocks, 70%-60% in bonds. Preservation of capital: Ideal for those in retirement drawing income for living expenses: 20% in stocks, 80% in bonds. Diversification applies not only to asset type, but also to the individual assets owned. Steer clear of investing in just one stock or one bond. Consider low-cost, well-established mutual funds. When you own a mutual fund, you are pooling your money with others to afford greater diversifi-cation and professional management. Start by finding a mutual fund company that offers a wide variety of low-cost funds, including a simple fund of diversified stocks and a simple fund of investment grade bonds. Once you have established allocations in each of these funds, you can continue to add monies each month (dollar-cost averaging, no matter what the markets are doing). There are many well-established mutual funds that charge no front-end fees and have low annual investment expenses. Look for mutual fund families that have a large selection of low-cost funds, preferably with annual expenses of less than 0.5%. Select funds that have at least a five-year history of solid performance relative to their benchmark. Go online to fund these funds, since retail brokers will need to charge additional fees to pay for their services. As with most things in life, there are costs. Individual investors need to know the costs and keep fees as low as possible. Don’t be misled when a salesperson tells you there are no fees. In fact, avoid salespeople as their services will cost you additional money. You can control how much you pay to have money managed in a mutual fund by researching carefully the cost before you invest. Every mutual fund has what is called an expense ratio—that is the percentage annually charged to cover administrative expenses. For some mutual funds, the annual expense is as high as 2.00%, meaning you pay $2 annually for every $100 you have invested. Some funds also have additional costs, such as sales charges, trading fees, fees when sold, commissions, etc. All these expenses must be disclosed in order for the fund to stay in business. By law, fees must be disclosed in the fund’s prospectus. You can easy access the information online. These expenses add up over the years and create a major drag on your net investment perfor-mance. So, find a low-cost mutual fund that charges ONLY an annual expense ratio below 0.05%. There are many of them available, and the long-term performance of these low-cost funds usually outrank the more expensive funds. It pays to shop around before you invest. Once you’ve diversified and found low-cost mutual funds, the biggest challenge is to stay the course. Avoid trying to time the market with the day’s hot stock picks. No one knows the future, including the so-called experts—people who get paid to encourage you to buy and sell. Stay the course by checking on your asset allocation (diversification) once a year, rebalancing if you’ve moved away from your target by 5% or more. You can rebalance by boosting the under-weighted asset with new contributions or by exchanging the over-weighted asset fund for shares in the under-weighted fund.